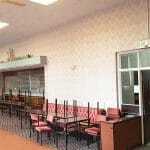 Fishburn is a small village in County Durham, that used to be mining town. 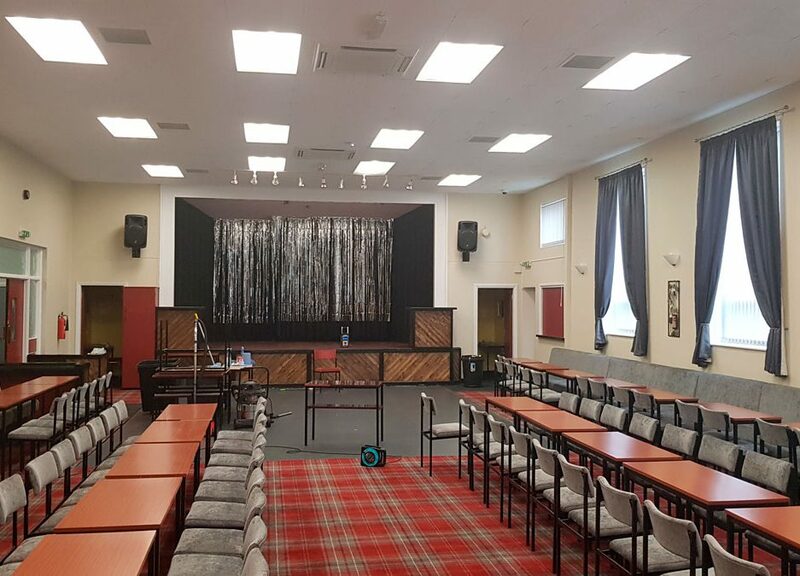 The pit was closed years ago, but the working men’s club, which opened in 1961, remains a place that is the heart of the community. 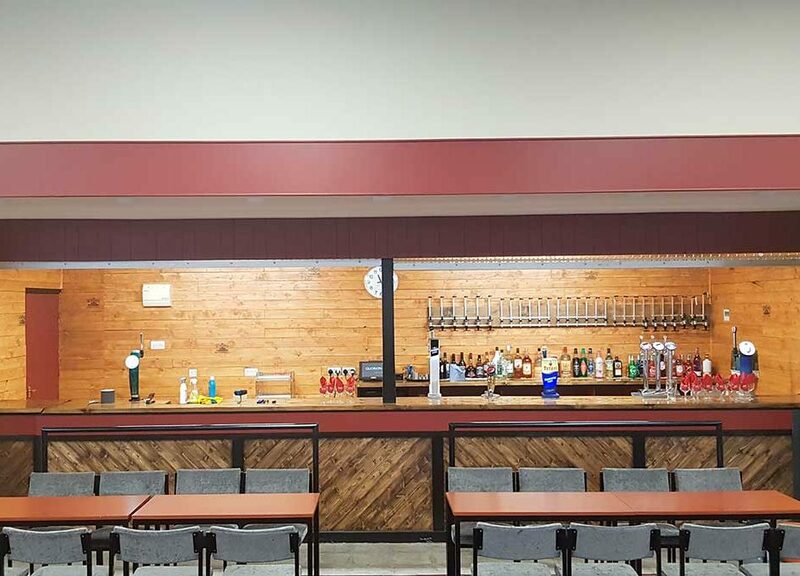 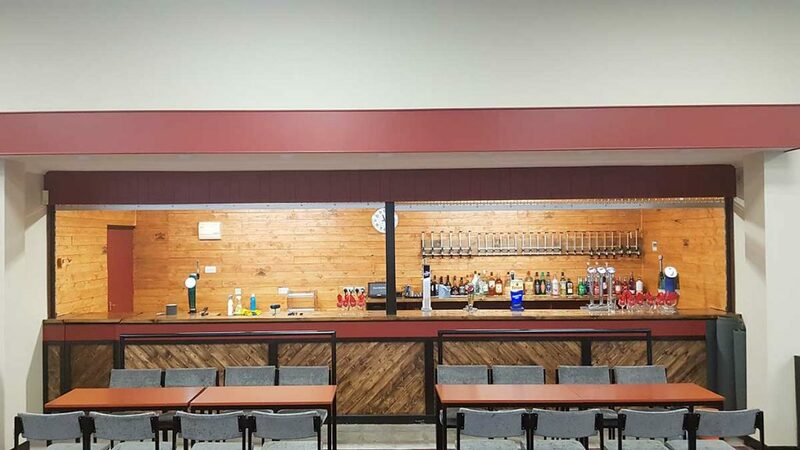 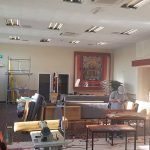 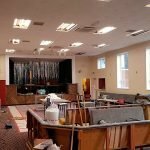 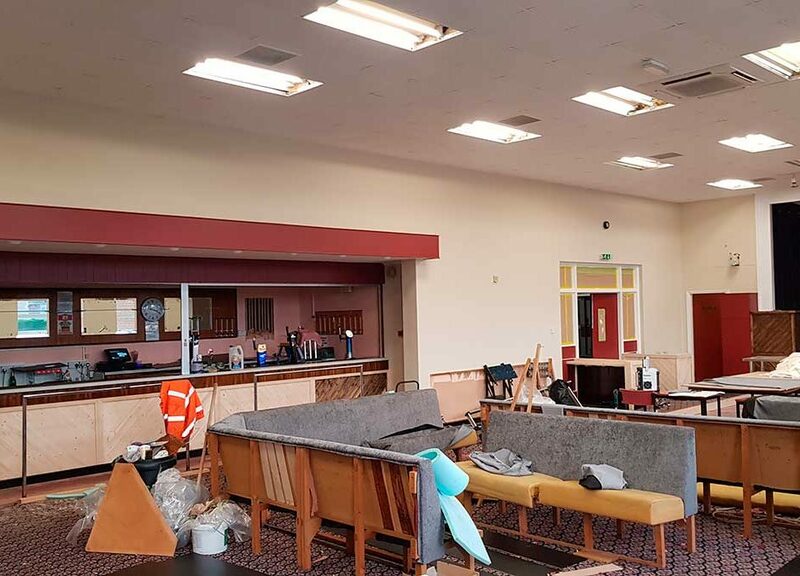 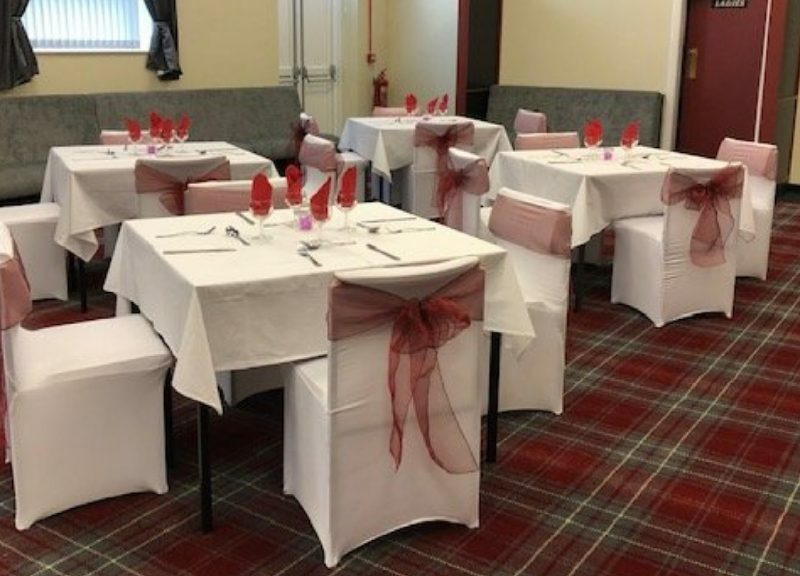 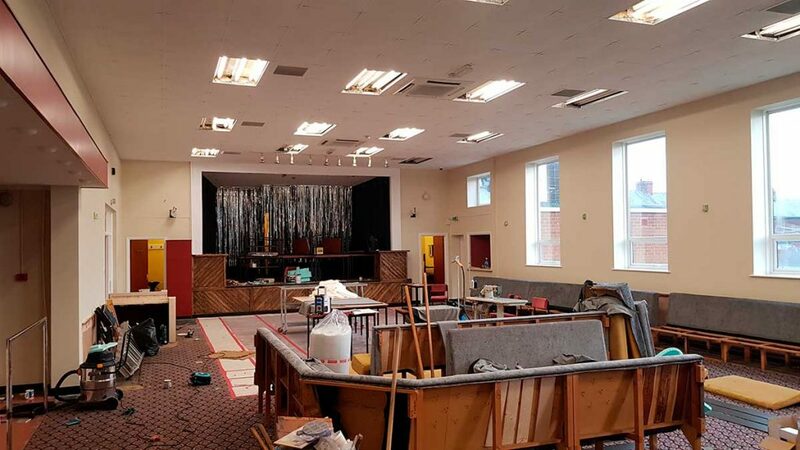 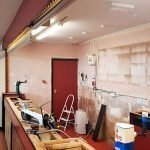 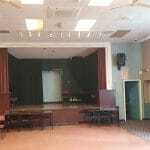 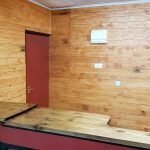 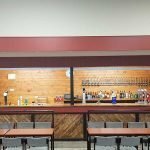 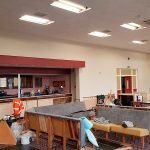 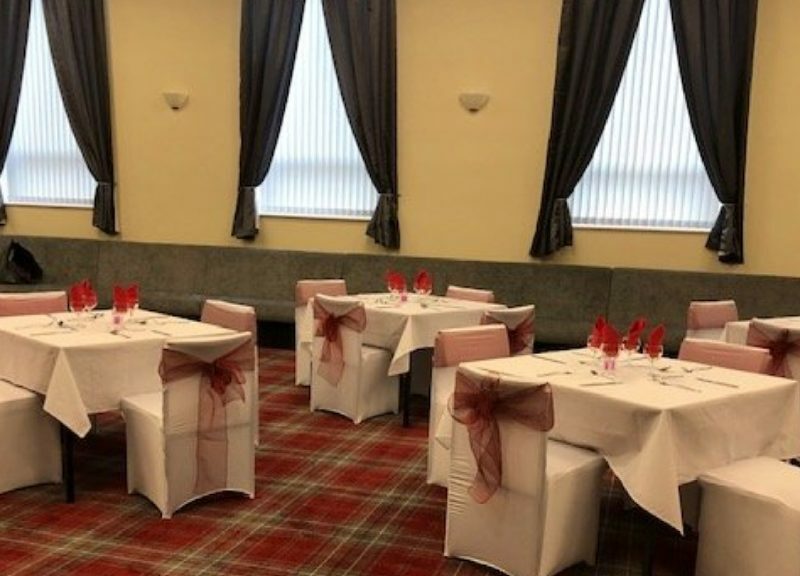 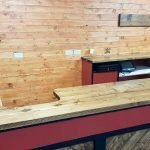 The committee had been saving funds for a significant period and after more than thirty years, Fishburn working men’s club has just undergone a major refurbishment. 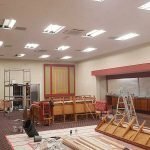 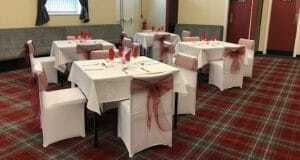 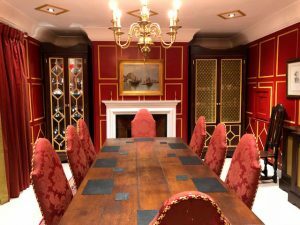 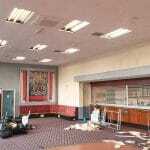 The project entailed a full refit, including decorating, new carpets and a dance floor. 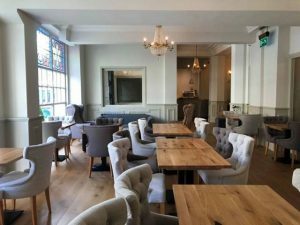 All of the furniture was reupholstered, and a full refit was carried out to the bar area. 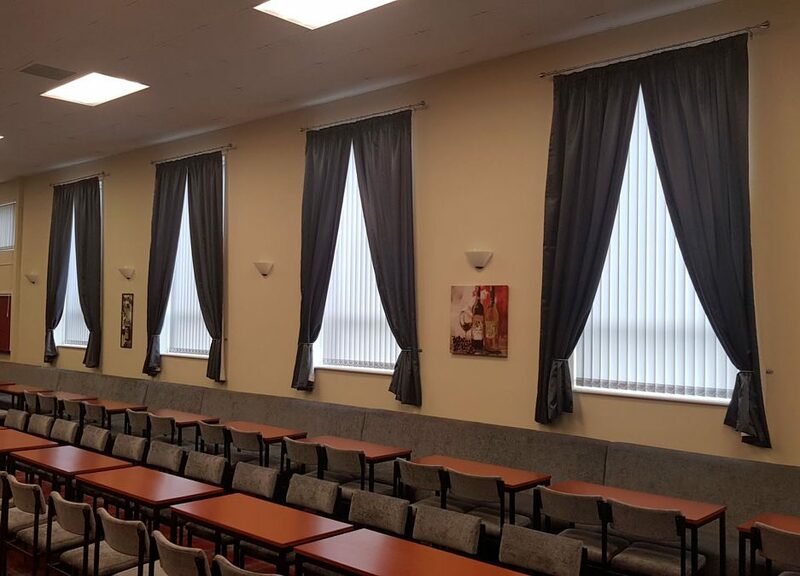 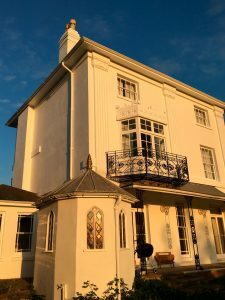 When Adam Featherstone of Adam Featherstone Decorating Services was first asked to quote for the project, he spent time explaining to the customer how he would approach the job and the methods and paints he would use and why he would use them. 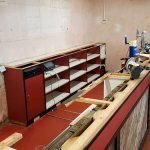 He later learned that it was this approach, that had convinced the customer he was the person for the job. 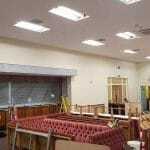 When Adam started on site, he brought in fellow professionals John Kerry and Sharlene Foster to help to tackle the job. 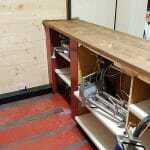 Adam said, “Luckily for John he only had to lend a hand for 3 days, before jetting off to Mexico for two weeks”. 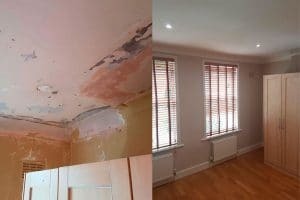 Specification for the job was to strip the wallpaper and sand the walls and wood work, using both Mirka and Festool dustless sanding systems. 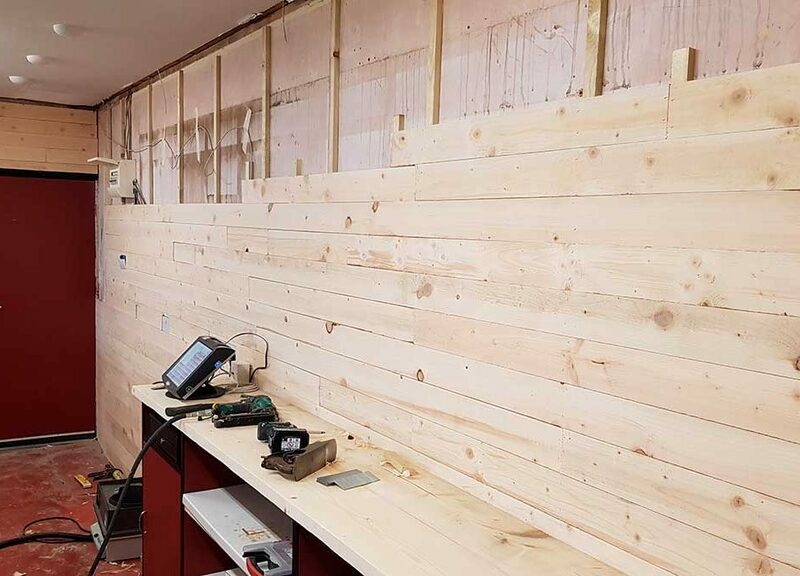 The walls were then sealed, and skim filled. 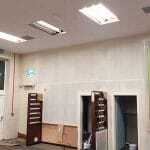 The ceiling was sprayed in white emulsion and the walls were finished in a durable matt. 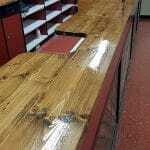 The wood work was then finished in a water-based satinwood. 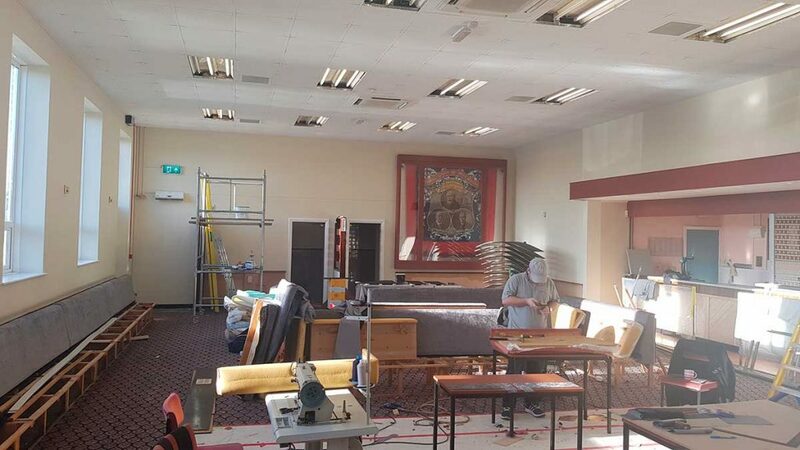 The first job was to strip the wallpaper and remove the fitted furniture, so it wasn’t in the way. 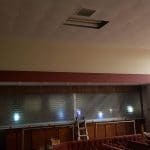 Whilst John and Sharlene got to work on that, Adam started to mask the ceilings for spraying. 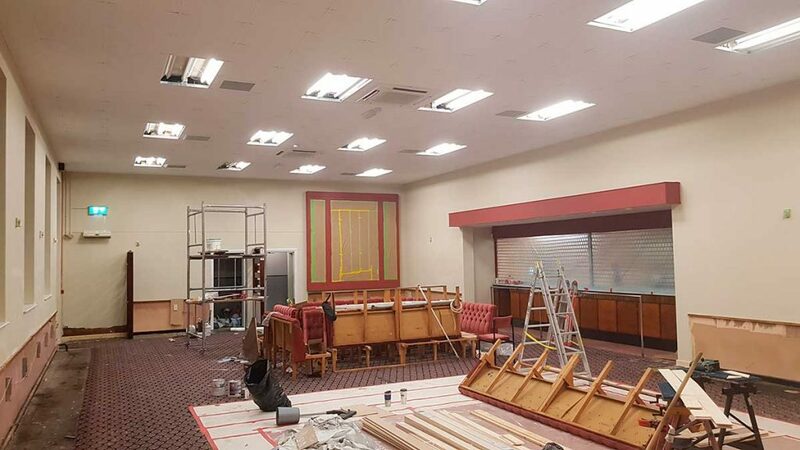 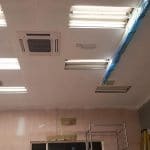 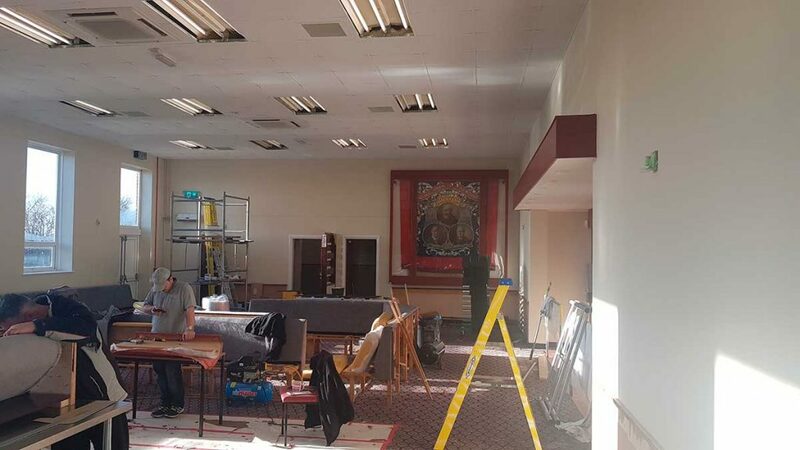 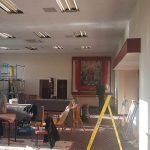 The first problem Adam encountered was that some of the ceiling tiles needed replacing and the diffusers over the lights were braking when removed. 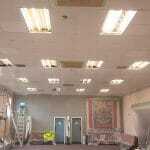 Adam found a local supplier for the ceiling tiles and replaced them as he was masking off. 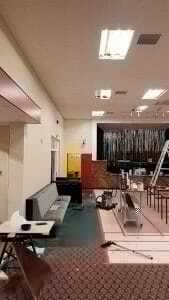 The diffusers were replaced after the work was completed by the clubs handyman. 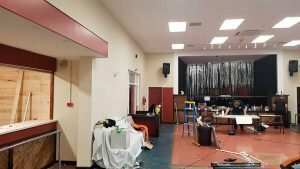 Once the ceiling was masked ready for spraying, Adam sprayed it using a Graco 495 airless sprayer, using Tikkurila Anti Reflex 2 White. 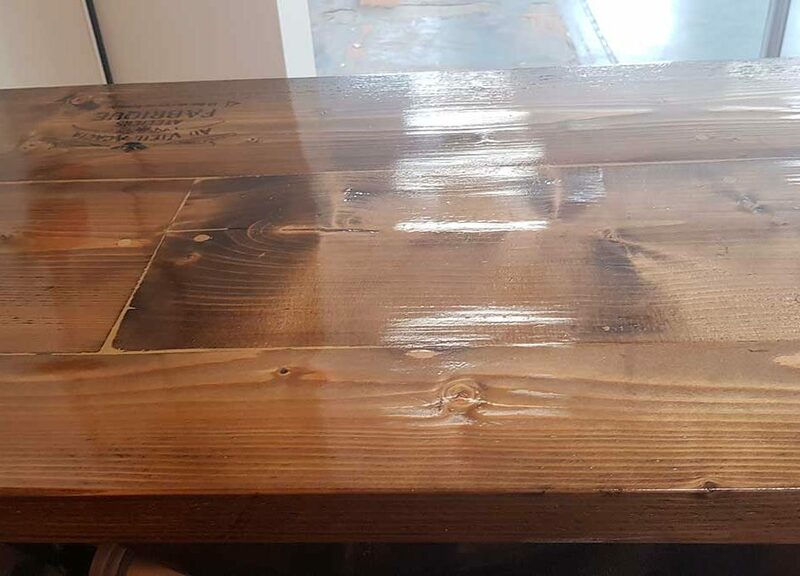 He felt this was the right product for the job as “it’s a perfect flat matt paint, it does not flash or dry patchy and is easy to apply with brush and roller or by sprayer”. 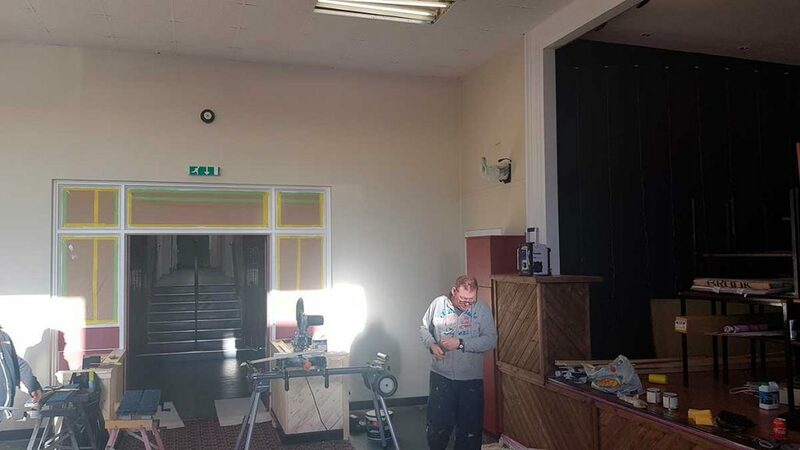 Adam said “John had the lovely job of pushing him around and making sure the paint didn’t run out, but once the ceiling was finished, on the third day John left for Mexico”. 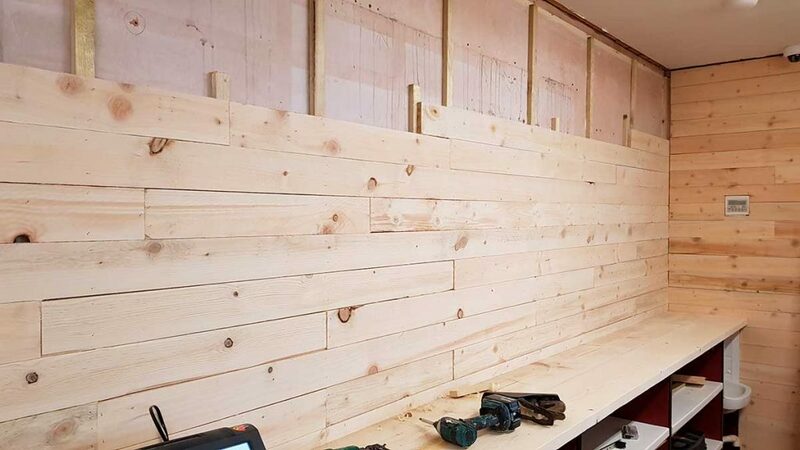 With the ceiling completed, it was time to focus on the walls. 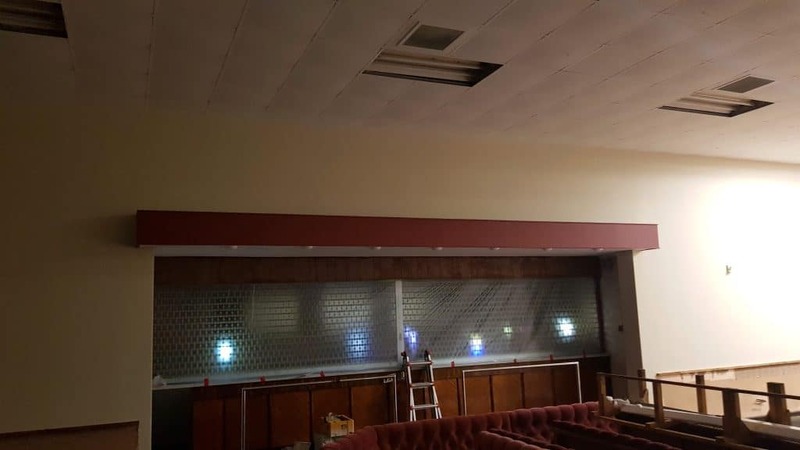 Once the wallpaper was removed, they were sanded with a Mirka dust free sanding system, then sealed with Zinsser Gardz. 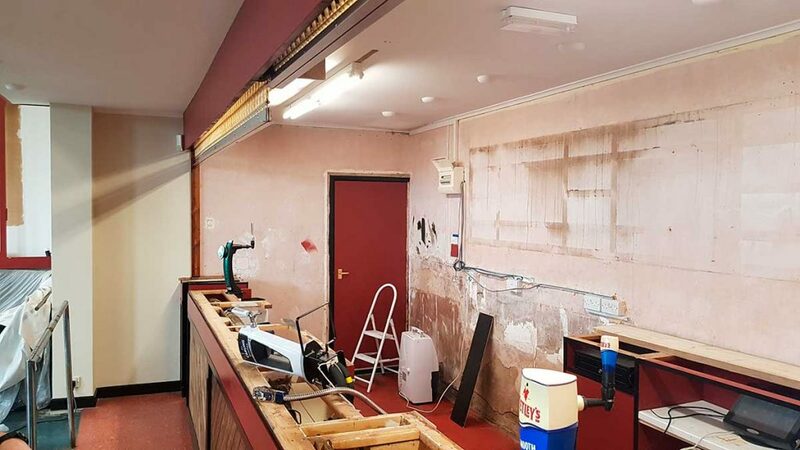 The original plan was to fill the walls where needed, but once the wallpaper had been removed, it was clear the walls would need to be skimmed filled. 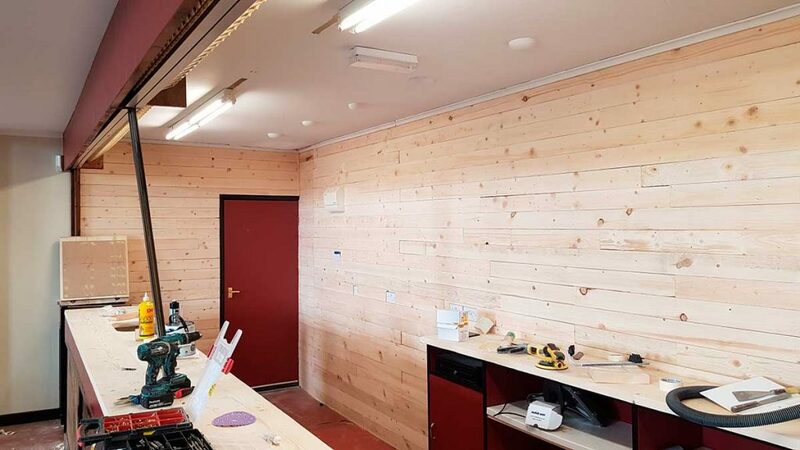 For this, Adam choose Tikkurila Presto LF ready mixed filler. 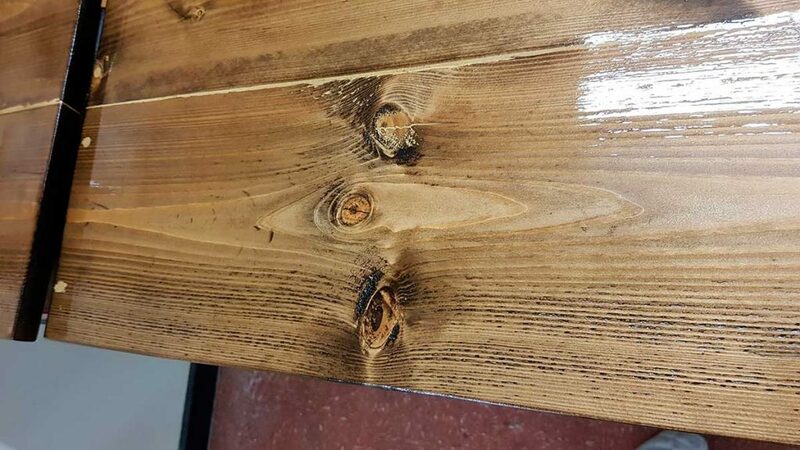 Once that was dry, it was again sanded with the Mirka system. 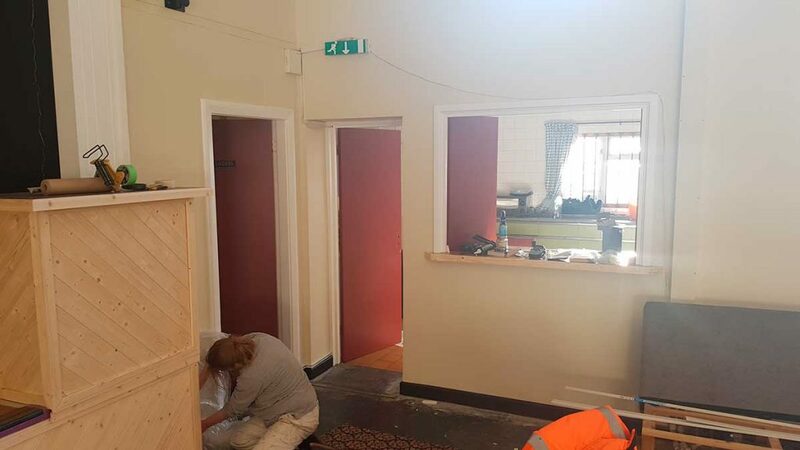 The walls were then given a coat of Tikkurila Optiva Primer, mixed into the finished colour, to seal the filler and start to give the walls a base colour. 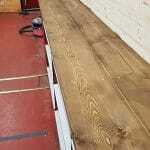 Once that was dry, two coats of Tikkurila Optiva 5 was applied. 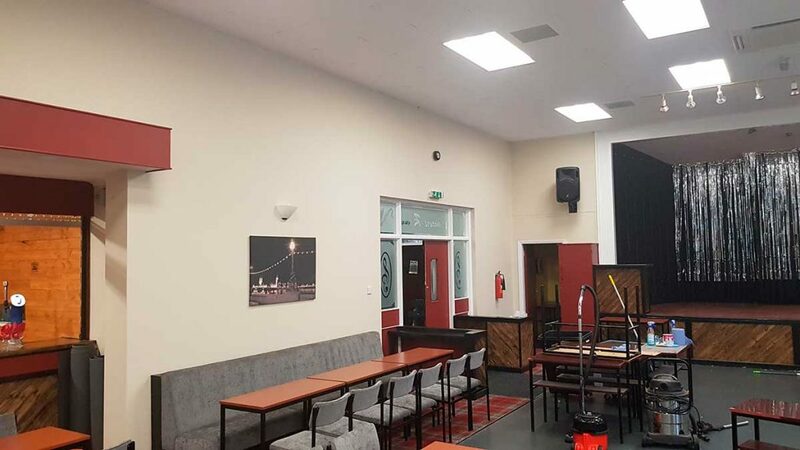 Adam chose this product as it is a durable matt and would give the club a finish that they can clean as they need to. 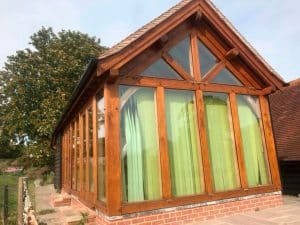 Most of the wood work was brand new and the old bits were sanded with the Mirka and Festool sanders. 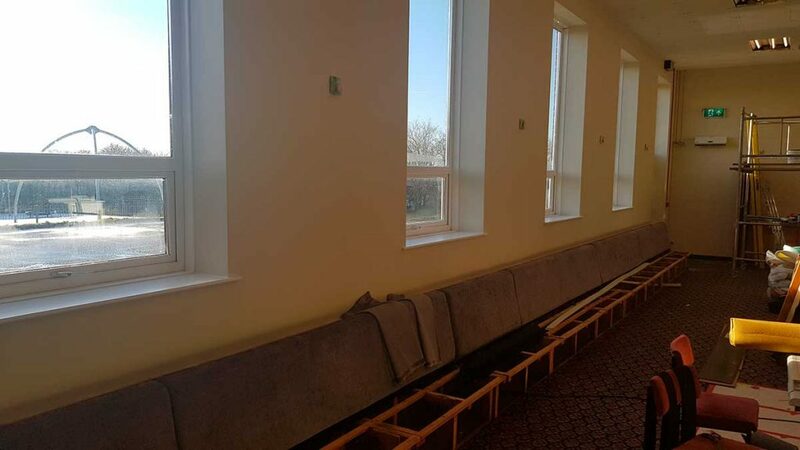 The skirting boards were finished with Bedec MSP black and a touch of water, which Adam said, “was a dream to apply”. 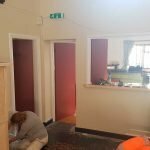 The doors and door frames were finished in Benjamin Moore Advance satinwood, which was chosen as Adam said, “it is excellent; tough, durable and leaves a gorgeous finish”. 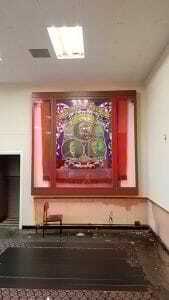 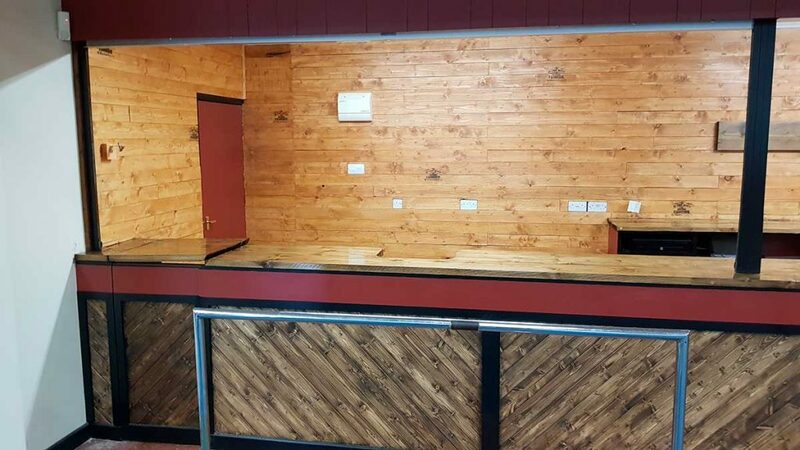 The front of the stage was re-finished with pine cladding. 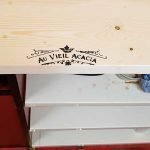 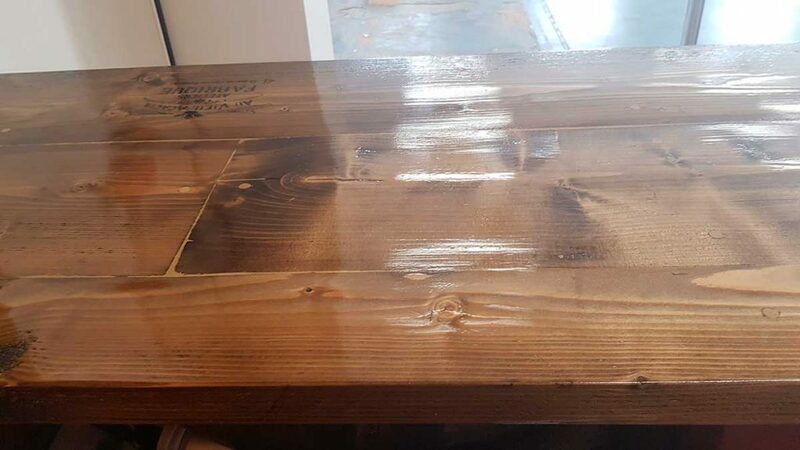 It was given a coat of Liberon wood dye, and two coats of Tikkurila Kiva 30 satin lacquer, a job which had Sharlene’s name written all over it. 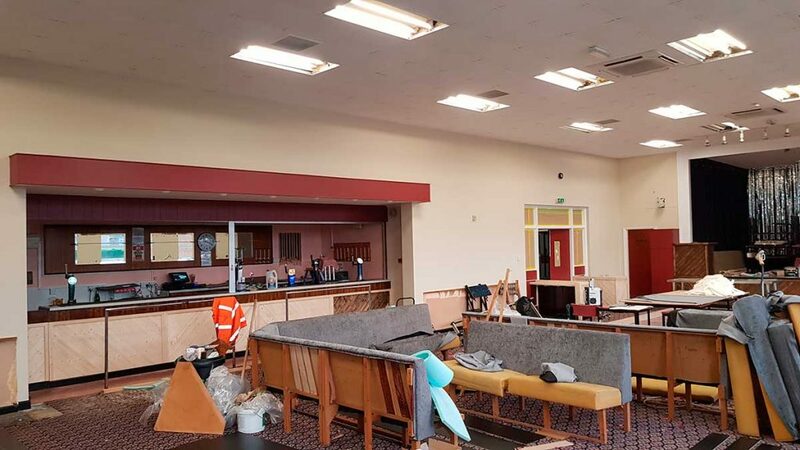 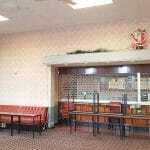 Once the room was completed it became clear that something had to be done to the bar area. 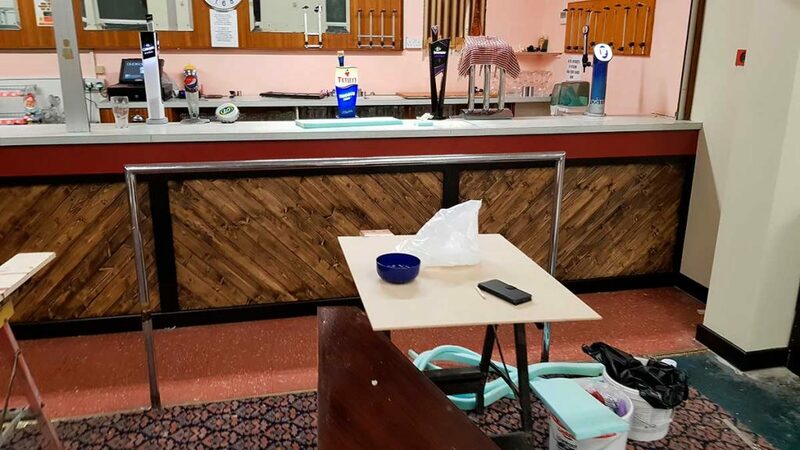 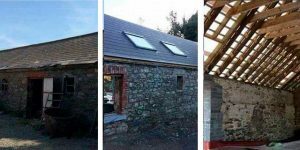 This had not been included in the original specification, so Adam went back to the committee and showed them photographs of some of the bars he had worked on previously. 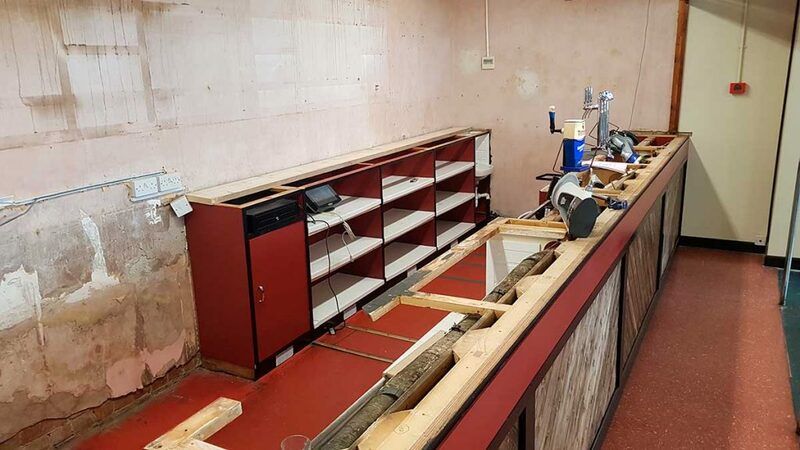 The committee then asked him to quote for the additional job of refurbishing the bar. 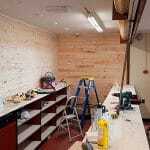 Adam’s quote was accepted and fortunately, Adam’s Dad is a brilliant joiner and was happy to help Adam on the project. 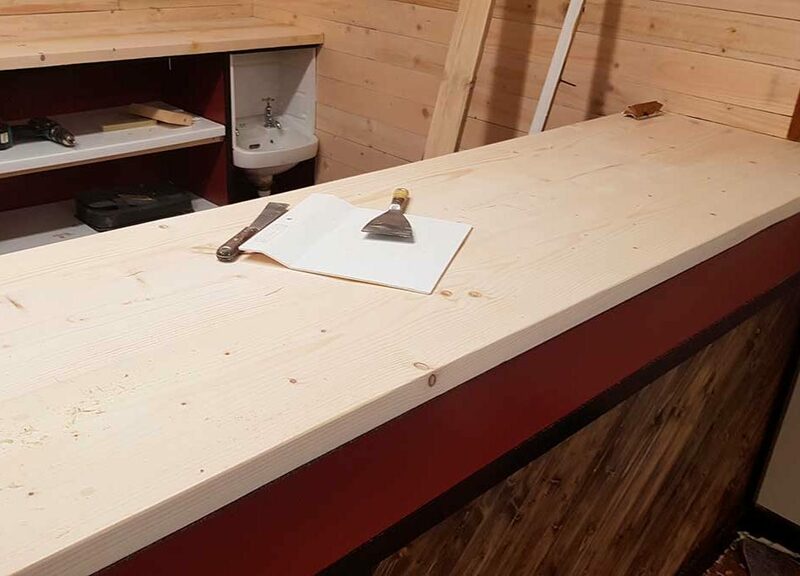 He put a plan together for behind the bar. 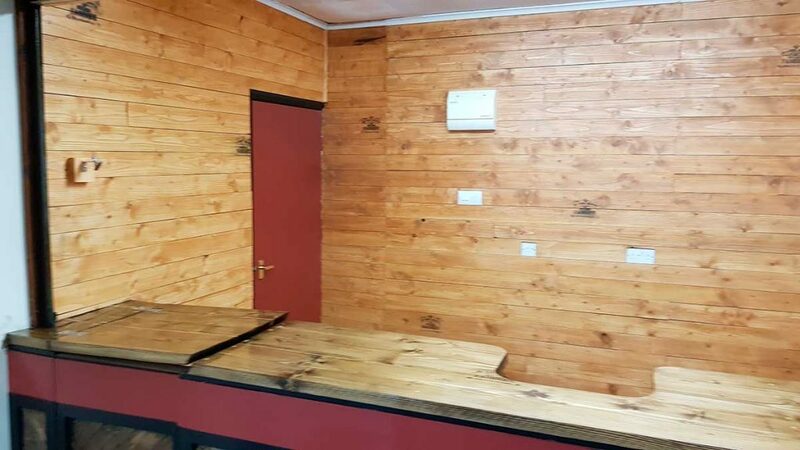 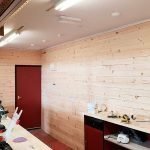 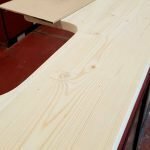 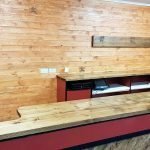 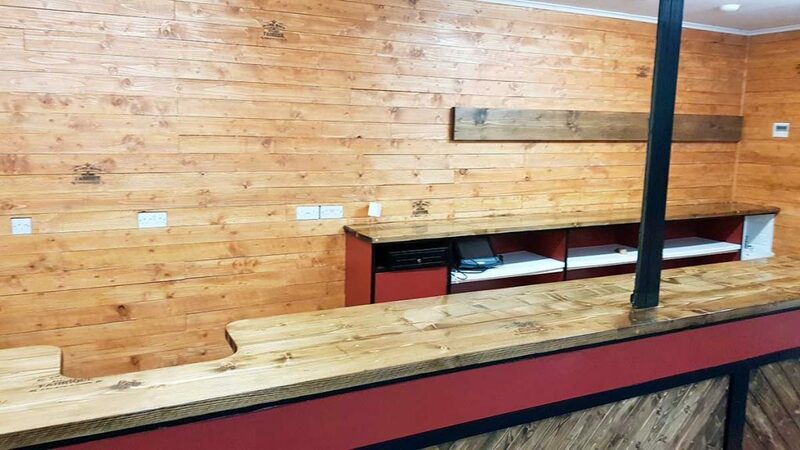 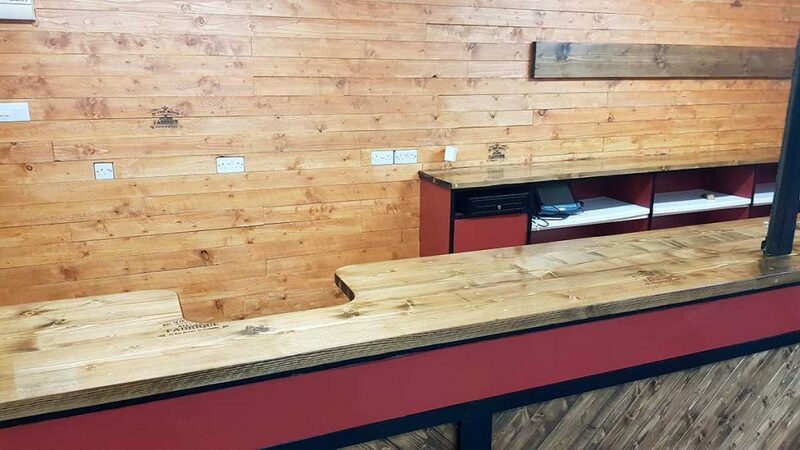 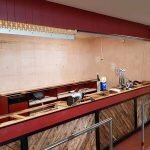 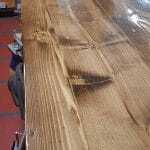 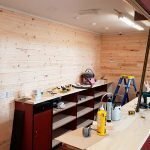 This involved the bar tops, which were made from scaffolding boards and the walls which were clad in rough sawn 4 x 1 timber cut to different lengths, and sanded fairly smooth prior to fitting. 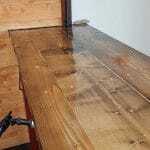 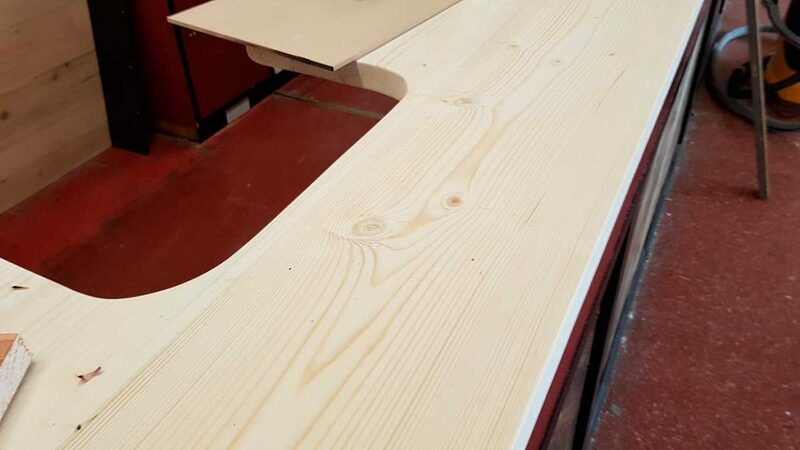 On completion of the joinery, Adam started with the sanding of the bar tops with 80 grit up to 500 grit. 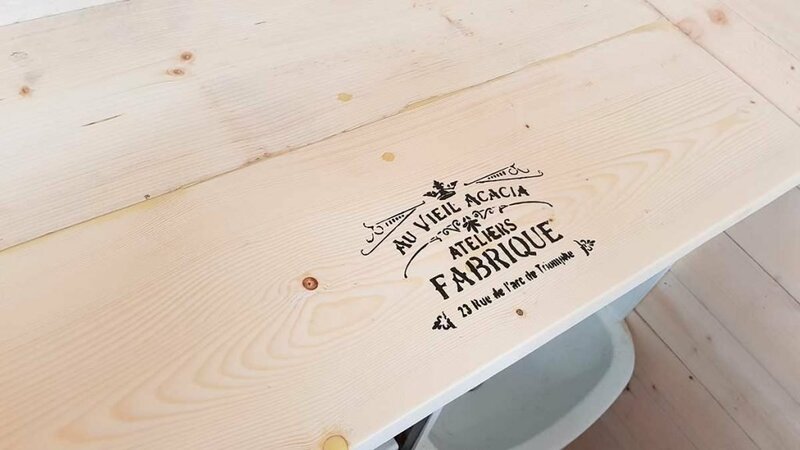 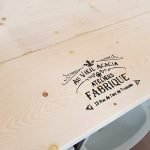 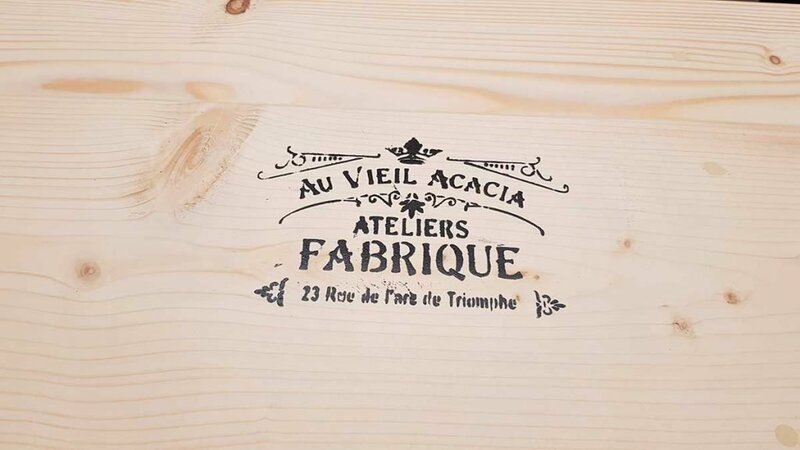 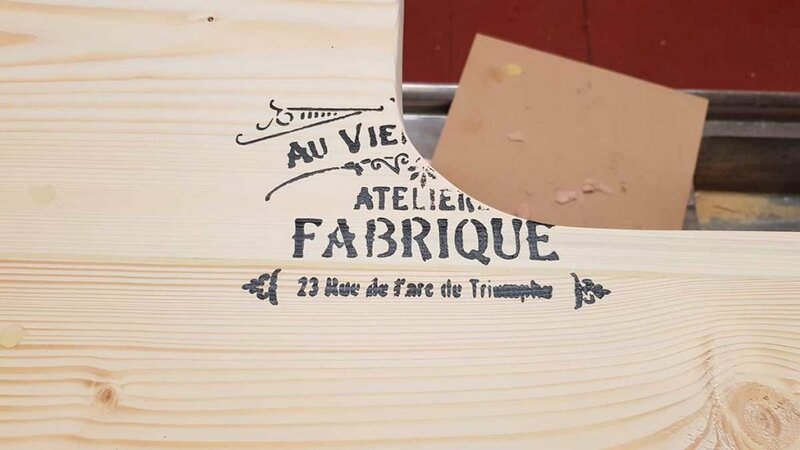 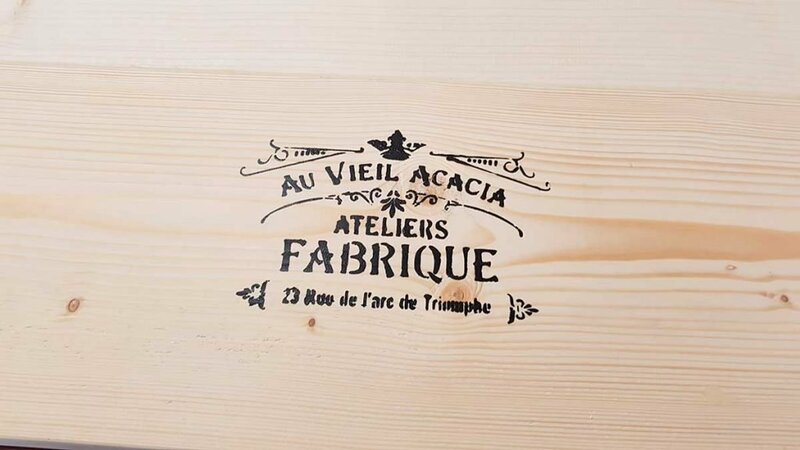 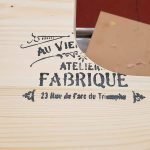 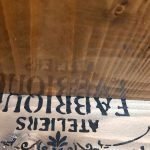 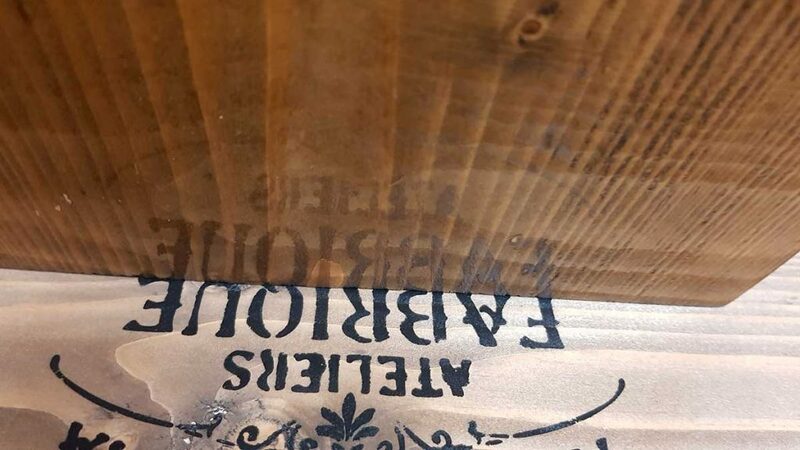 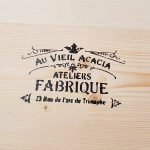 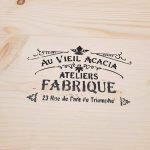 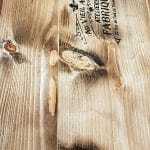 Once filled and sanded, Adam applied a coat of Liberon wood dye, then applied the stencils to help give it an old world reclaimed timber look. 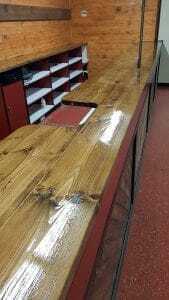 The bar tops were then given a thinned coat of Tikkurila Unica Super 90 high gloss urethane alkyd lacquer. 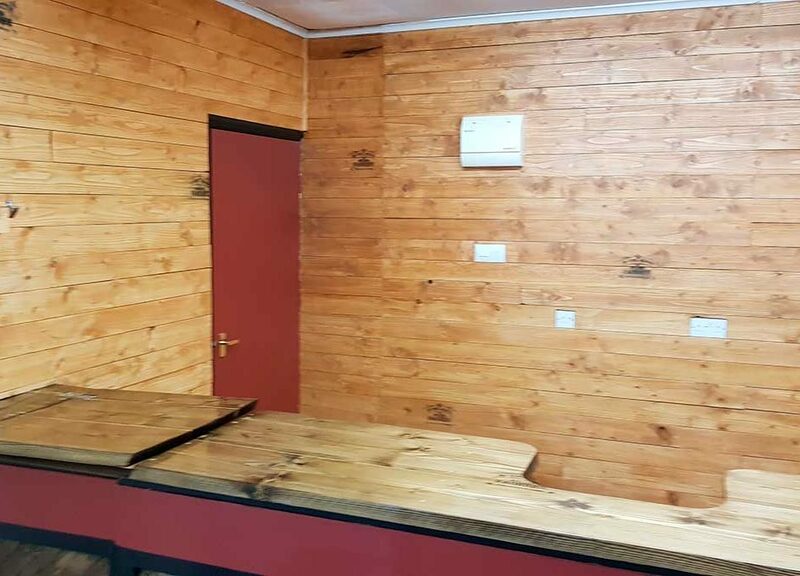 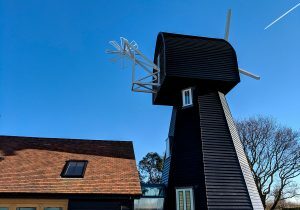 Once dry it was denibbed with 800 grit Mirka disks, then two full coats of Unica Super 90 was applied to give a high gloss finish and the cladding was finished in Tikkurila Kiva 30. 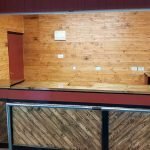 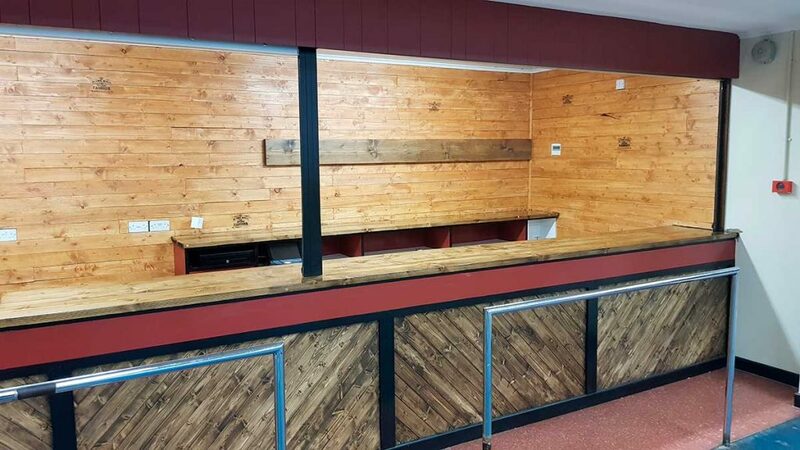 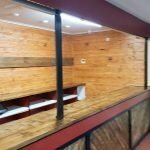 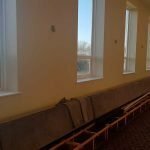 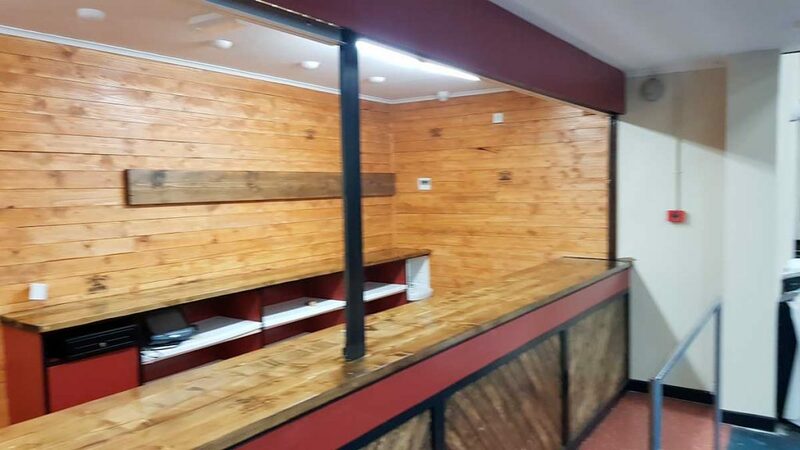 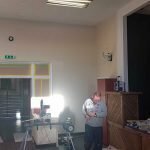 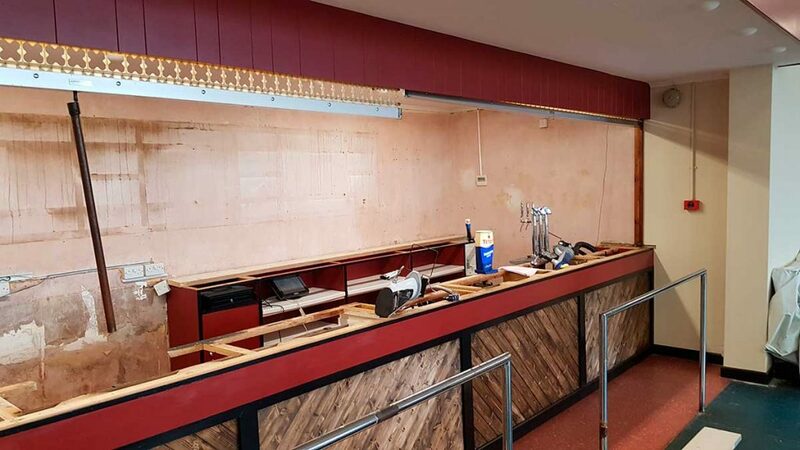 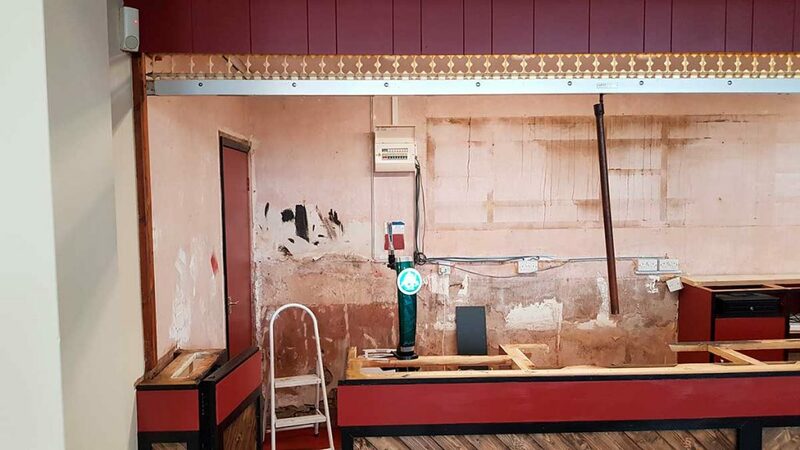 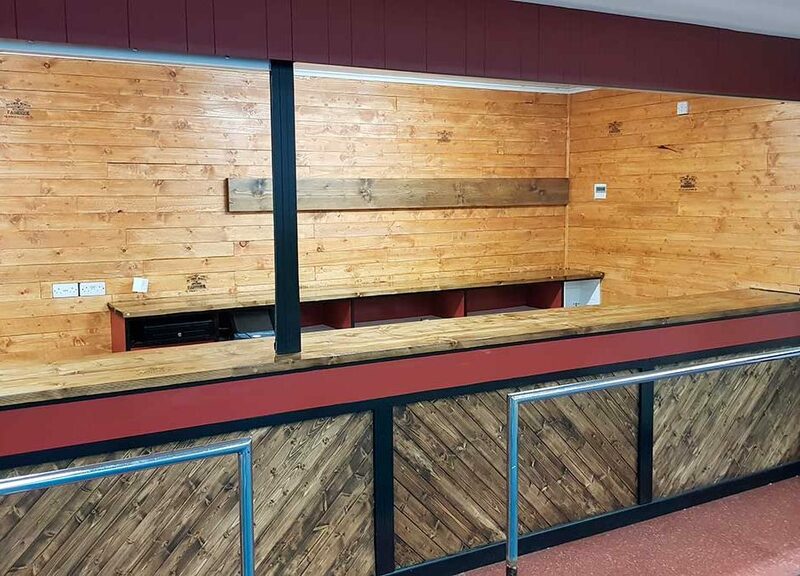 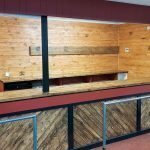 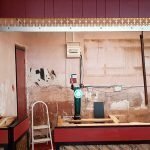 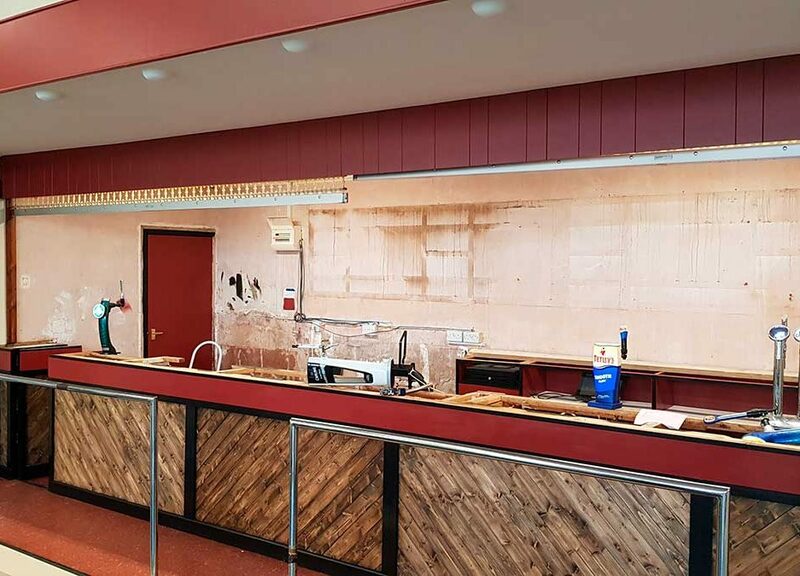 During the job, one of the committee members mentioned that the next thing they wanted replace were the shutters on the bar, but as they are quite expensive it would take some time to save up the funds. 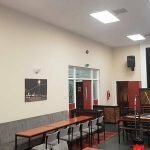 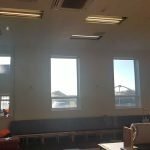 Adam mentioned that they could be sprayed and was able to quote for this additional work, which was again approved and added to the job. 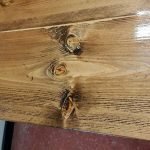 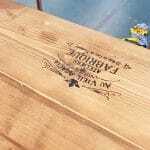 In order to spray the shutters, they first had to have 30 years’ worth of grime and nicotine remove. 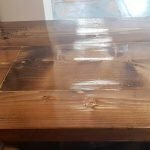 Adam used Zinsser universal degreaser and cleaner, and unfortunately the only effective way to apply it, was to use a toothbrush. 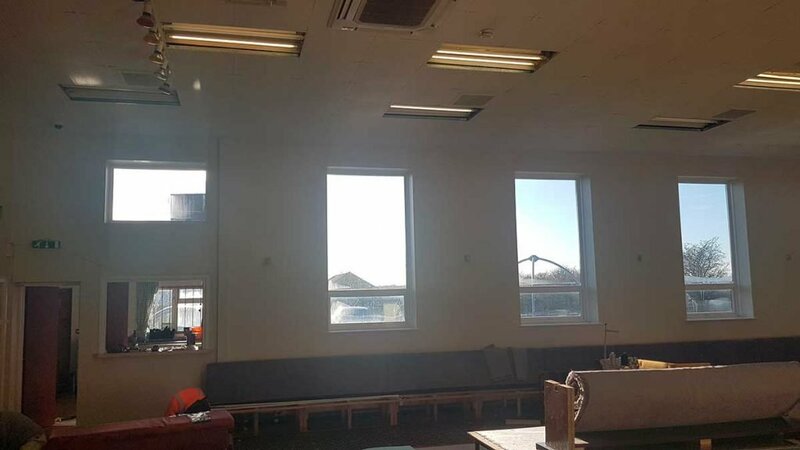 Adam said, “Thankfully my 14-year-old son had chosen this week to be naughty at school, so after a full day of cleaning the shutters, I personally found it a funny type of punishment”. 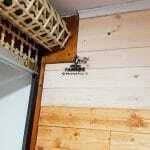 Adam Featherstone is a married, father of two children. 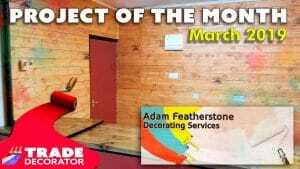 He started his company; Adam Featherstone Decorating Services in 2008, and it has gone from strength to strength with each year. 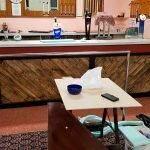 Adam prides himself that he only uses two forms of advertising in his area; his van and an advert in a local parish magazine. 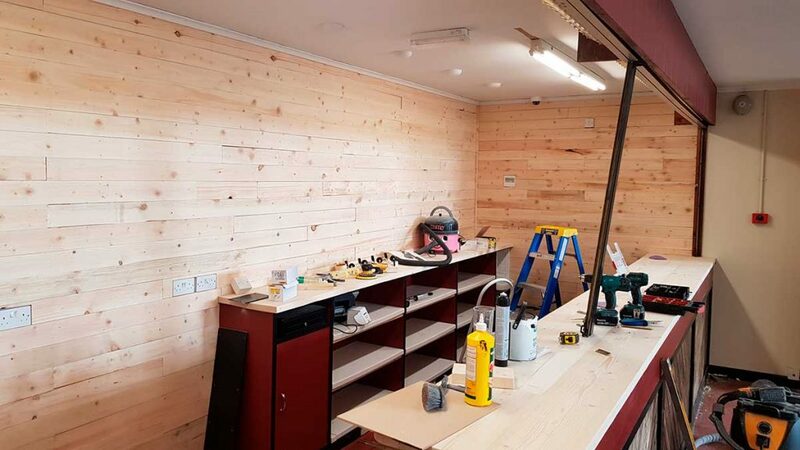 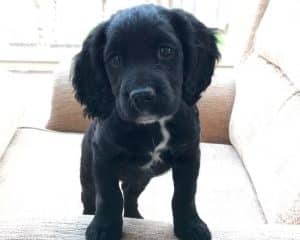 Adam’s family have always worked in construction, his dad, brother and niece are very talented joiners, and his uncle has his own construction company. 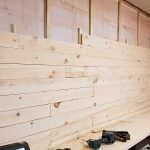 Adam take great pride in working on jobs that they have built. 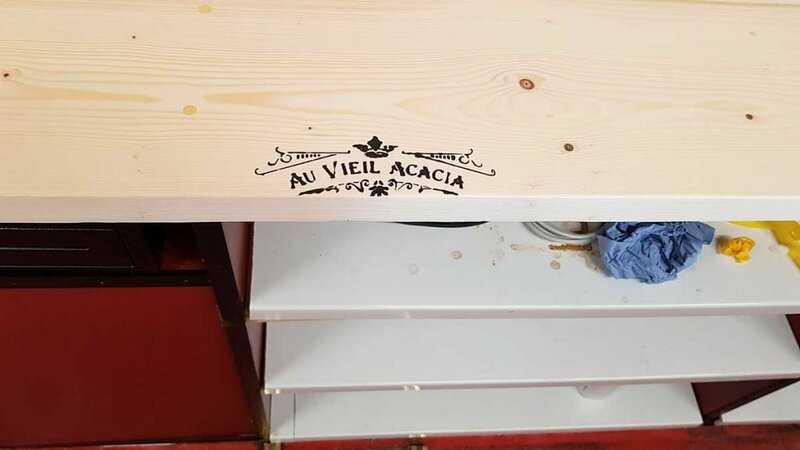 If you would like to submit a project to be considered for Project of the Month submit your project using the button below by the 18th of the month, when we will make our selection.